United Utilities, the United Kingdom’s largest listed water company, manages regulated water and wastewater treatment plants and networks for 3 million households and 200,000 businesses. When the UK’s water industry was privatized 25 years ago, providers were required to implement asset management programs (AMPs) whereby water boards tendered contracts to construction firms to update the industry’s antiquated assets and help keep infrastructure properly maintained. Each AMP lasts for a five-year period; in 2015, the industry moved into AMP6, which will end in 2020. United Utilities is investing GBP 6 billion in AMP6, with GBP 2.9 billion dedicated to delivering more than 200 capital projects. The investment is intended to improve the utility’s massive water infrastructure to deliver better quality water, provide a cleaner environment, and lower customer bills over the next five years. United Utilities’ leadership recognized that the utility needed a better data structure and asset management to ensure efficient implementation of its AMP6 program and improve delivery on capital projects. They chose a collaborative building information modeling (BIM) approach to link operations with asset creation and capital maintenance. 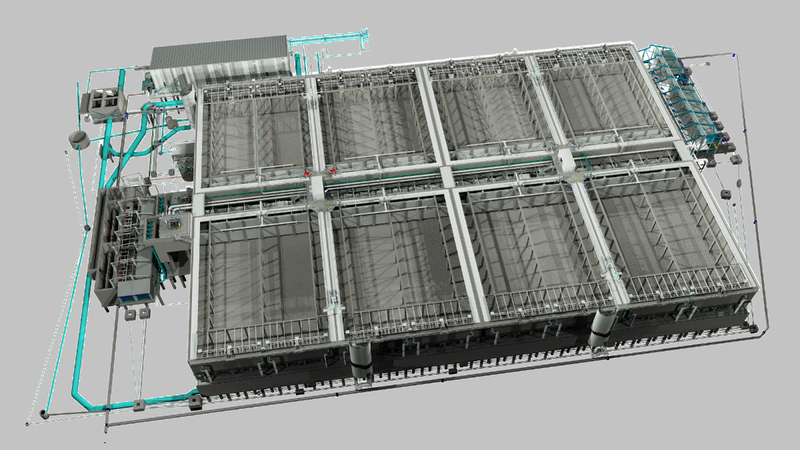 “United Utilities adopted BIM [as an attempt] to leverage the efficiencies that BIM would deliver in project delivery,” commented United Utilities lead BIM technologist (CDE), Gregg Yarnold. With numerous construction and engineering partners working on a multitude of water infrastructure projects, United Utilities required collaborative, comprehensive project management tools. Using ProjectWise, a suite of project collaboration software from Bentley Systems, United Utilities configured the British industry specification standard BS 1192 module to align with its business requirements in accordance with AMP6. The organization developed a structured data naming convention in a connected data environment for the dispersed project teams to develop, share, and coordinate their design information. Working in this setting, every team member has access to all approved data, removing the need to transmit data from one system to another and ensuring that all team members are working on the most up-to-date information. With ProjectWise, United Utilities was able to extract digital data about its assets from delivered projects and import it into other systems, such as asset management and business applications. Now that it owns the data from design conception through to commissioning, and can customize the system to enforce a data structure tailored to its business the United Utilities team can more efficiently integrate new assets. As a result, the utility is expecting to save an estimated GBP 40 million on the capital delivery program. In addition, a collaborative, uniform system for managing digital data allows for more efficient operation of its water infrastructure assets, potentially yielding even more savings over the lifecycle of the asset. Keeping asset data from being compromised has become a priority for the industry. A collaborative BIM approach not only streamlines information management, by aligning digital data with the physical asset and enabling new project data to be incorporated into existing asset information models, it also enhances data security. “As we move into the collaborative digital world, we have the opportunity to actually tighten the security around our asset data,” stated Yarnold. In contrast to previous models, where contractors were working in their own environments with traditional methods of data sharing, such as custom web portals or hard drives, ProjectWise provides a connected data environment for all team members, eliminating the need to transmit outside United Utilities’ system. It also allows United Utilities to store its data on premises, behind company firewalls. Having a single source of truth accessible to all project team members in a secure environment via ProjectWise eliminated the need for data transmission, saving the utility team time and reducing risk. Image courtesy of Bentley Systems. Integrating design, clash resolution, and construction sequencing helps give users confidence in United Utilities’ digital asset data. Working in a federated BIM design environment, using Bentley Navigator to perform clash detection provides designers assurance that the design can be constructed with minimal onsite changes. Navigator is a BIM model review and collaboration software solution that enables teams to test their design and construction methods in a connected digital world, reducing cost, time, and waste; minimizing environmental impact; and facilitating engagement with the supply chain for more reliable off-site design for manufacturing and assembly (DfMA). The increased use of DfMA allows United Utilities to produce more project elements in a controlled factory environment, reducing onsite rework, noise pollution, and impact to the local communities by minimizing the number of construction vehicles needed to make site deliveries. 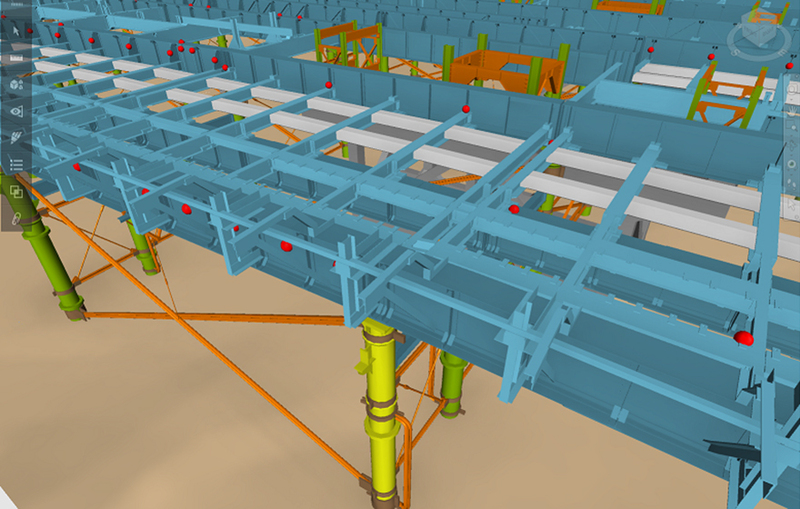 Using Bentley Navigator for construction simulation and sequencing not only facilitates construction efficiency for United Utilities projects, it also helps optimize workflow processes by enabling team members to understand in advance where each activity fits within the flow of the whole project. When used in conjunction with ProjectWise, all project participants at all levels of complexity have access to this critical information. With all four of its construction delivery partners adopting a BIM strategy for construction delivery projects under the AMP6 program, United Utilities is focusing its efforts on expanding the BIM approach asset maintenance strategies to further facilitate efficient delivery of capital projects. By creating its own BIM Academy, the utility intends to inform and educate all project participants on its BIM process to increase cooperation across all project teams.